Fantastic collection, Steve. Keep up the good work on here and on Twitter. Up the hammers!! Hi all, Gainsborough Trinity supporter. Great site Steve and growing fast. Trinity sold many players onto WHU in the 30's so there's the link !! Great twitter account too. Regards to everyone footy fans everywhere. Nice site Steve! very impressive collection of badges you have. Manchester United supporter so its good to see some of our badges on your site! Keep it up Steve! 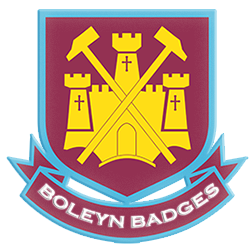 Cracking Site Steve, Amazing collection,keep it going mate..
Hi there, I have been interested for a long time, in a small & simple crossed hammers badge, not too big, sort of pin badge size (very discreet). I have seen some around, but mostly too big - any thoughts??? ?